Houston Toll Road Debt Defense Attorney Cory Roth was interviewed by Amy Davis on KPRC Channel 2 about the ‘secret’ Harris County Toll Road Authority Administrative Toll Road Court. While this court may be a secret to many Houstonians, it isn’t a secret to Attorney Roth. With 3 years of experience, Cory Roth is the only attorney in the Houston, Texas, area that regularly represents people in the toll road courts. Not only is Attorney Roth very familiar with the court, he has saved individual clients lots of money: hundreds, thousands, and tens of thousands of dollars. While the portion of Attorney Roth’s interview that was played on TV was brief, nearly all of Amy Davis’s knowledge about the toll road court came from Attorney Roth. Continue reading to learn more about how Cory Roth Law Office can help you. Is Attorney Roth Accepting New Toll Road Cases? Yes. Cory Roth Law Office is currently accepting new toll road violation debt cases in Harris County and Fort Bend County. If you have been sued in Fort Bend County, be aware that you likely have court on Friday, May 26th, at 10 A.M. or 12 P.M. Not only are we currently accepting new cases, but we are interested in speaking to people who have paid the full mount demanded by the Harris County Toll Road Authority, as we are investigating whether we need to file a Class Action Law Suit. What Are Attorney Roth’s Fees? The team at Cory Roth Law Office reviews each preliminary intake form you fill out on our toll road page before setting a fee. We do this because it is nearly impossible to have a one size fit all fee structure, as each case is different. That being said, we do not accept cases unless Attorney Roth believes he can help save you money. In other words, if we don’t think we can save you money, after paying our fee, we will reject your case. Odds are, we will be able to help you. What are the Odds of Cory Roth Law Office Eliminating All Debt? Unfortunately, the odds of eliminating all debt are very small. By law, the only toll debt cases where Linebarger Law Firm must dismiss the case and cancel the debt are cases where the debt was incurred after the vehicle at issue was sold or stolen. Make sure to transfer the title after a sale, and report your vehicle as stolen as soon as it happens. Attorney Roth has represented hundreds of clients in toll road court. He can count on one hand the number of clients who he was unable to save any money for, and even those clients received long term payment plants that Attorney Roth negotiated, and would not have been otherwise given. We make no promises or guarantees, but we have saved clients hundreds, thousands, and tens of thousands of dollars. It all depends on the facts of your case. Why Do I Owe Money To The Harris County Toll Road Authority? 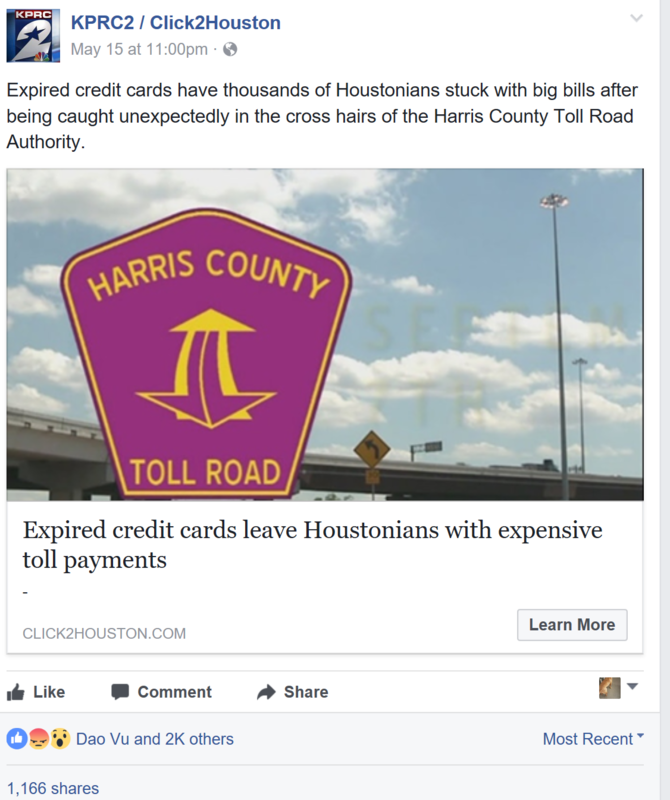 From the comments you have left on Channel 2’s Facebook page, many of you know why you owe money to the toll road authority. At Cory Roth Law Office, we will send you an intake form for you to complete. The purpose of this form is to identify not only the exact reason why you owe money to the Harris County Toll Road Authority, but also identify mitigating facts and circumstances to justify a reduction in the amount you owe. The odds are that you are either a straight violator, which means you should not expect a huge reduction, or you had an EZ Tag account and there was a problem. The most common problems include: failing to update your credit or debit card after it expires, is lost, is stolen, or is canceled due to fraud or identity theft; you failed to update your license plate; you failed to activate your EZ Tag; or, you simply had insufficient funds at the time you drove through the tolls. Does Attorney Roth Save Client Money? Attorney Roth has saved individual clients hundreds, thousands, and tens of thousands of dollars over the years. He has saved clients money in administrative court and without ever having to show up to court. Attorney Roth has saved clients money in Harris County and Fort Bend County. Attorney Roth has also saved clients money in Harris County Civil Courts at Law. In all, Attorney Roth has saved clients hundreds of thousands of dollars.